Last week I asked: Where is the Carousel Capital of the World? 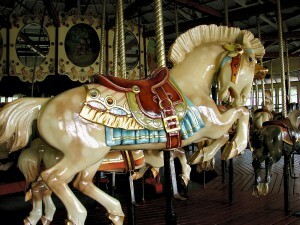 There is something magical about a carousel or a merry-go-round that appeals to all age groups. The Binghamton area has been dubbed the Carousel Capital of the World because out of only 150 antique carousels remaining in the United States and Canada, six are in the greater Binghamton area. All six are on the New York State Historic Register and the National Register of Historic Places. They are located in C. Fred Johnson Park in Johnson City, the George W. Johnson Park in Endicott, Highland Park in Endwell, Ross Park in Binghamton, West Endicott Park in Endicott and Recreation Park in Binghamton. John and I visited Recreation Park to see their carousel which is one of the most beautifully restored ones. It was installed in 1925 and has 60 jumping horses, chariots and the original two-roll Wurlitzer Military Band Organ with bells. All the carousels were made by the Allan Herschell Company in North Tonawanda in what is called the “country fair” style. The area owes its carousels to George F. Johnson, a shoe manufacturer who, between 1919 and 1934, donated the six carousels to local parks because he felt they contributed to a happy life and would help youngsters grow into useful citizens. So that everyone could enjoy the magic of a carousel ride he insisted that the rides should always be free and only required that “one piece of litter” be deposited in the receptacles instead of money. John and I also visited the Bundy Museum where we learned about the beginning of IBM. The Bundy brothers opened a time recording clock company. 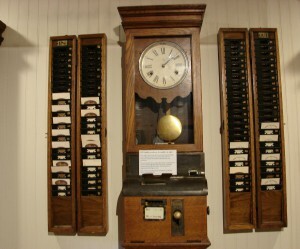 Time recording clocks were where workers “clocked” in when they went arrived at work and “clocked” out at the end of the day. The company flourished and eventually grew into IBM. The house is a testament to the elegance and beauty of the Victorian age; however, there is much more to see in the annex. There is a Broadcasters Hall of Fame next to their broadcasting studio. Especially fascinating was an exhibit dealing with one of their “favorite sons,” Rod Serling. Serling grew up in Binghamton and is best known as the creator of the Twilight Zone. The displays include replaying some of his famed programs on a vintage TV along with many of the shows props and other artifacts. We parked near the Anthony Brunelli Fine Arts Gallery. 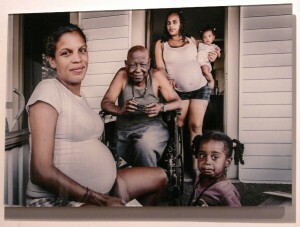 The works of Tice Leaner were on exhibit and it was a thought-provoking display of daily life of people in the Binghamton area – the people we never see. Visitors should not miss the Roberson Museum and Science Center which has a variety of displays. We found their “Vintage 1954-1964” a fun trip down memory lane. 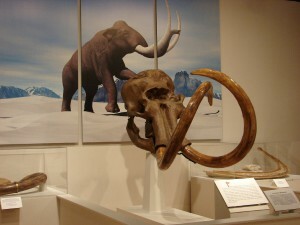 In the more distant past their “Journey from our Prehistoric Past” is fascinating with a Randolph Mammoth skull as a centerpiece, the most complete mammoth specimen fount in NYS. Actually, there is a variety of displays to interest visitors. The model railroad display depicts what Binghamton, Johnson City, Owego, and Endicott looked like in the 1950s. There is also a pictorial history of the area. Connected to the museum is the 1904 Roberson Mansion with a sweeping grand staircase. 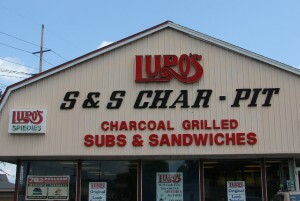 We know no visit to Binghamton is complete without enjoying their local specialty, spiedies, so we had lunch at Lupo’s where they lay claim to the “original” spiedie sandwich. Trivia Tease™: Where can you see the Cardiff Giant?